Why don't you just make sandwiches? If John Peralta had a hoagie for every time a Filipino offered him some variation on this advice for his new food truck, he'd have the inventory to battle Wawa. But that's just not what he wants to do. 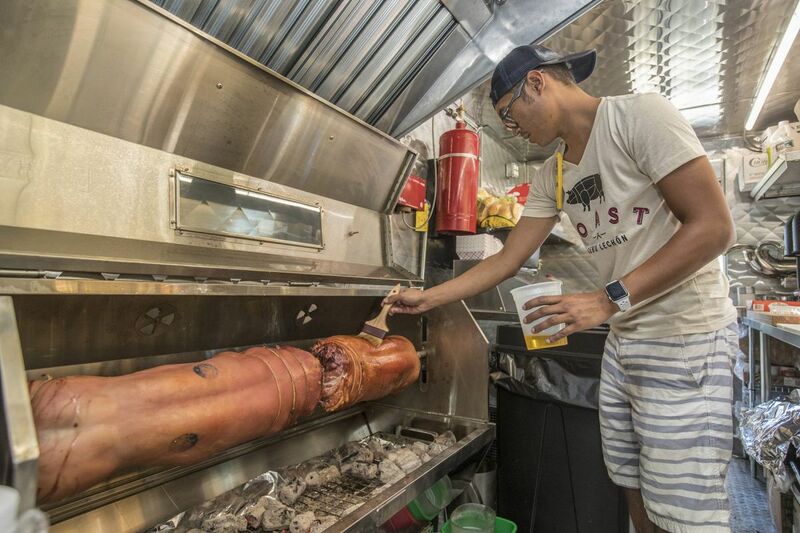 Instead of taking the expected street-food route, the Voorhees native is making every effort to recreate real-deal Cebuano lechon, spit-roasted pig, on board Roast, the glossy four-wheeled kitchen he rolled out in Penn Treaty Park last week. And if you're not familiar with lechon, or Filipino food in general, you're the exact eater Peralta wants to meet. Though Filipinos are among the largest immigrant groups in the country — the most recent U.S. census had individuals who identify as Filipino or part-Filipino trailing only the Chinese in terms of Asian populations on American soil — the food of the Philippines has remained relatively foreign to a wider audience, especially in comparison to other Asian cuisines. There are plenty of reasons for that — the older generation's desire to assimilate and some Filipinos' natural reluctance to share their humble home cooking with outsiders among them. Before eating her sisig from the Roast food truck, Angela Hwang had to take a photo of it. But that's finally beginning to change, thanks to chefs like Peralta, 35, one of a number of American-born children of Filipino immigrants with the desire to celebrate the food he grew up eating. A sincere fusion food built upon a wildly varied base of Malay, Spanish, Chinese, indigenous, and American influences, Philippine cuisine is at once familiar and peculiar. If you've never tried it, it can be difficult to wrap your head around — and unless you grew with Filipino family, friends, or neighbors, there's a good chance you're in this camp. Regionally, it's an issue of access. There are just a handful of mom-and-pop Filipino places in Northeast Philly, South Jersey, and Delaware, and Philly has only recently started to get some city-limits action, in the form of chef Lou Boquila's year-old BYO, Perla, and the ongoing Pelago pop-up dinner series. Chef John Peralta with two orders of Cebu-style lechon at his Roast food truck..
For Peralta, this dearth of options was a major motivator drawing him away from catering and restaurant cooking. After graduating from Eastern High School and attending the Culinary Institute of America, he spent the first part of his career in New York City in the corporate catering world. He parlayed that experience into a job as executive chef at the Barnes Foundation in 2013. There, he played quite literally with the concept of food as art, theming menus for high-end cocktail parties and sit-down dinners around various painters and exhibitions. After Peralta left the Barnes, he landed in the kitchen of 7165, a restaurant and music venue on Germantown Avenue. When structural problems with the building forced the closure of that operation this year, Peralta, along with his sous-chef and longtime family friend Andre Galvez, suddenly found himself without a home base — as good an opportunity as any to make his long-term goal of Filipino food in Philly a reality. Peralta already had hands-on experience with native Filipino cooking after a 2009 trip to the Philippine island of Boracay to help his father, also a chef, with the launch of a new golf facility. Peralta learned from the local chefs there, digging deep holes right on the beach and filling them with slow-burning coconut-shell charcoal to cook split whole hogs, their cavities stuffed with seasonings that permeate the flesh over hours of slow roasting. Cebu-style lechon, six ounces of pork served with pickled green papaya and vegetable atchara and a pan de sal. Peralta had the motivation and skill but needed to figure out how to recreate this cooking style for an urban American audience. With the support of his wife, who had been encouraging him to look into running a food truck, he bought a truck in the spring and got to work outfitting it with a rotating spit. Powering his mobile pit with low-smoke, high-heat coconut charcoal he sources from Angelina Branca at Saté Kampar (who uses the same briquettes to grill skewers at her Malaysian BYOB), Peralta prepares Pennsylvania-raised suckling pigs in the style of the famed lechoneros of Cebu, a centrally located region of the Philippine archipelago. Cooks all over the Philippines do lechon, but Cebu has a reputation for doing it the best. But what exactly makes Peralta's pork Cebu-style? It's all in the prep. "We're treating it like we're native," he says. He stuffs his pigs with lemongrass, bay leaves, red onion, garlic, chilies, and other carefully considered aromatics, and he also relies on suka, or cane vinegar, a vital building block of Filipino cuisine that serves as both a flavoring and tenderizing agent. Prep the piggy �� time! The results, when executed with skill and care, are transcendent — tender, melty, mildly fragranced pork, fatty but never greasy, with intoxicatingly crisp skin that cracks like hard candy between your teeth. Roast's lechon — which Peralta serves for $11 with pandesal, a sweet breakfast bread; atchara, a pickled papaya slaw' and chili-infused dipping vinegar — is the primary attraction of his truck, which currently vends in Penn Treaty Park on Saturdays and is easing into regular appearances in Fishtown and on Spring Garden Street. But it's not the only item on the menu. Peralta breaks down the heads and bellies of his pigs to make sisig, a crunchy chopped pork hash served over garlic-fried rice that goes extremely well with ice-cold beer, and lumpia, or fried spring rolls, filled with homemade longanisa sausage. "I think people appreciate that we're using the whole entire animal," he says. On for the rest of the summer is halo-halo, the one-of-a-kind Filipino dessert of shaved ice combined in a cup with condensed milk, mung beans, jellied fruits, plantains, flan, purple yam ice cream, and other doodads (Peralta tops his with Trix cereal). Halo-halo means "mix-mix," which is what you're supposed to do with the concoction with a spoon before you eat it. So far, the chef has taken great pleasure in exposing the unfamiliar to this distinctly Filipino hot-weather treat, customers who include his young son's teacher, who had never had it before ordering one at Roast's Penn Treaty debut. "She said, 'That was so weird, but so good,' " says Peralta — a marketable slogan for halo-halo, and Filipino food in general, if he's ever heard one. Peralta says the overall response to Roast, so far, has been tremendous. A younger contingent of Filipinos and Filipino Americans eager to taste his stuff have been tracking his movements via social media, a promising sign that he's not the only one with a passion for growing this cuisine beyond the private kitchens and church banquets that have contained it for so long. "I'm happy that the Filipinos that have been trying it are accepting it and promoting it," he says. "But now it's time to push it out even more."